a proud, haughty Fermina Daza rejects the hopeless innocent love of Florentino Ariza, and instead settles for a seemingly perfect, wealth, looks, reputation and education wise man Dr. Juvenal Urbino. The ups and downs of unrequited love of Florentino and seemingly fuller life of Fermina and Juvenal, is what the story is weaved of. On the way we also meet interesting, quirky and scandalous characters. It was inevitable: the scent of bitter almonds always reminded him of the fate of unrequited love. Dr. Juvenal Urbino noticed it as soon as he entered the still darkened house where he had hurried on an urgent call to attend a case that for him had lost all urgency many years before. The Antillean refugee Jeremiah de Saint-Amour, disabled war veteran, photographer of children, and his most sympathetic opponent in chess, had escaped the torments of memory with the aromatic fumes of gold cyanide. First things first. I don't even know why I picked and then decided to buy this book. On a landmark trip I had almost bought 100 years of solitude, but then because of a self imposed intervention did not buy it. Nonetheless I think it was destined that I read Gabriel Garcia Marquez's cholera first! Masterpieces don't need any recommendation. Because I tried it once and meandered hopelessly. 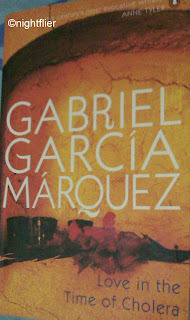 Hence I feel compelled to write what Roger Ebert says about Gabo's writing - 'I'm wondering, as I started by saying, if what makes Garcia Marquez so great a writer is his work's insistence on being read, not seen'. Having said that, I can now freely sing praises for the book. It's a book which grows on you. The carribbean setting, the colonial architecture, the scandalous characters, everything. And the triumph of the writer is in the fact that he doesn't make us feel empathy for any of them. He weaves a story by making the reader an observer, a bystander in those times, those places. The people in the book are on a quest for love, which each explores in his/her own way, as fate permits. And by the end of it, it all feels very peaceful and calm. There is no clamor of passion, hope or disillusion. Also the book has a very amusing and funny undertone. As if it knows what not to take seriously. 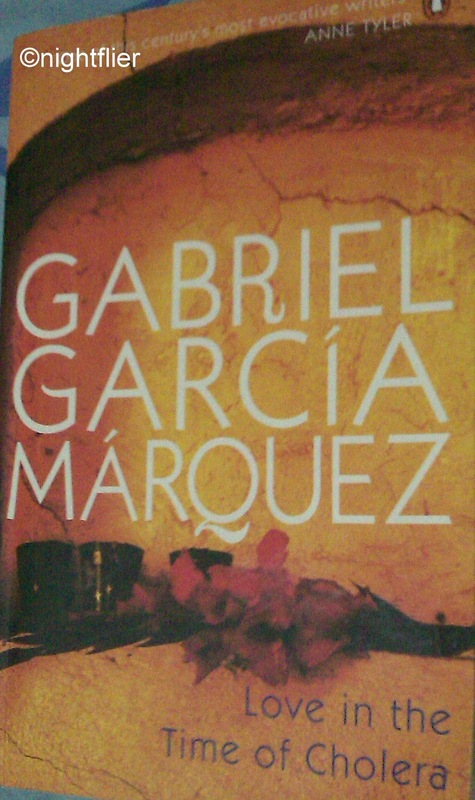 This is an extraordinary book which makes us wonder at Gabo's finesse as a writer. To imagine that I read a translation and not the original book, makes him all the more awesome. It was too heavy form me..I mean the prose..
One hell of a writer he is ! If you have time , you will love to be lost in his world ... though i am yet to check this book ..